Scheduled for Friday, January 27, 2017, the field trip will look at the impact of urban farming in Los Angeles County, the most populous county in the United States, and include lectures on such topics as the past, present, and future of urban agriculture, vertical farming, and sourcing local food from urban farms. Spots on the field trip are limited, and it will sell out. So grab your Early Bird Tickets before it’s too late! The USC Teaching Garden is utilizing aeroponics to challenge the food systems status quo on campus. The University of Southern California (USC) Teaching Garden was established this spring to supply fresh produce to the university’s on-campus restaurants, dining halls, catering services, and hotel, while also teaching students and staff about flavor and sustainability. The garden utilizes aeroponic towers to produce chemical-free fruit, vegetables, herbs, and edible flowers without traditional soil growing media. Local Roots Farms is an indoor vertical farming company based in Los Angeles that designs, builds, deploys, and operates controlled environment farms. Situated in shipping containers, the farms (called TerraFarms) grow with up to 99% less water, 365 days a year, pesticide and herbicide free, and with absolute consistency in production. Their plug and play form provides an innovative solution to the retail and foodservice sectors by greatly reducing supply-chain risks such as price volatility and food safety exposure. The Growing Experience (TGE) is a seven-acre urban farm in North Long Beach that is located on a previously vacant lot. TGE is unique in that it is owned and operated by the Housing Authority of the County of Los Angeles (HACoLA), which manages 3,229 units of public and other affordable housing for the county’s Public Housing program. The urban farm utilizes traditional as well as aquaponics growing systems to help meet the needs of the community by increasing access to healthy foods. Register Now for Early Bird Tickets! Rachel Surls – Sustainable Food Systems Advisor for UC Cooperative Extension and co-author of the book ‘From Cows to Concrete: The Rise and Fall of Farming in Los Angeles’. The Grow Local OC Conference field trip will stop at, from top left to right: Alegria Farm, Future Foods Farms, The Riverbed, and Urban Produce LLC. Only 10 spots remain for the Future Farm Field Trip on Day 2 (Nov. 11) of the Grow Local OC: Future of Urban Food Systems Conference. 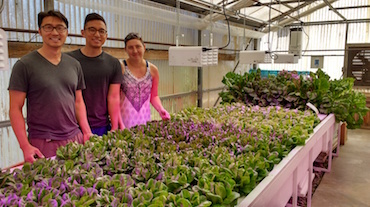 The field trip will of offer an excursion into the diversity of urban and state-of-the-art hydroponic and aquaponic agriculture operations in Orange County. Tour participants will be treated to lectures and sessions from pioneering farmers who are embracing innovative business models and growing systems to both increase food security and take advantage of the escalating demand for local food. On Day 1 (Nov. 10) of the conference, attendees will convene at the Portola Pavilion at California State University, Fullerton in Orange County, CA for a series of panels and keynotes that will address such topic areas as urban farming and local food access, the economic potential of indoor agriculture, local food policy, the benefits of community and school gardens, and more. The day will be anchored by a keynote address from Karen Ross, Secretary of the California Department of Food and Agriculture, on the importance of agriculture and local food systems in cities. Nate Storey, CEO and founder of Bright Agrotech, a company that develops vertical and high density farming equipment, will discuss the viability of indoor farming in cities at the upcoming Grow Local OC Conference at Cal State University, Fullerton on Nov. 10 – 11. The organizers of the Grow Local OC Conference: The Future of Urban Food Systems, slated for Nov. 10 – 11 at Cal State University, Fullerton are excited to announce that Dr. Nate Storey, the CEO of Bright Agrotech, a company that leads the industry in vertical and high density farming equipment, will be participating as a speaker. Nate began to have the first stirrings of what would eventually become Bright Agrotech when he was a student at the University of Wyoming. The program is well-known for turning out leaders in the farming and ranching fields, and Nate is no exception. He self-funded the startup while pursuing his Ph.D. in Agronomy. Bright Agrotech offers several services and products, including farm consulting and financial analysis. But they are best-known for their ZipGrow growing towers. The ZipGrow system is comprised of food-safe plastic towers filled with growing media that replace the need for soil. The towers weigh eight pounds each and are engineered to be hung or set on any surface. Despite only being three years old, Bright Agrotech enjoys approximately 10,000 customers across the United States and around the world.